Not knitting. Letting your arms drop and your hands release even this motion. Going where the words cannot follow. Listening to rhythms and melodies on repeat. Forgoing narrative and story long enough to find your way on the inside before having to explain yourself on the outside. Dropping all the way into memory and emotion like a deep well. Gathering what there is to gather before coming up again. Letting your face soften. Exhaling all the way. Trusting the ones you love to hold your frailty with gentleness and understanding. Allowing the passage of time to be a medicine. Patience while you find your way. Back to center. Forward to what's next (yes, of course--someday), but a long long spell of steady standing patience in between. Thinking of so many things you could be doing and saying, Not Today. Watching the sunrise. Doing what the day requires and no more. Ending the day under a blanket (by a fire if you're lucky) and repeating. Read more January 2014 writings here. It happened in late November. Five months of touring with Indie Kindred just wrapped, and after two quiet days I was already impatient that I wasn't feeling rested, bounced back and ready to get ON with it, already. That's when Jolie pointed out, You know, Jen, you've been going full-on since Justin broke his ankle and leg . . . in February. That's when I realized it was going to take more than two quiet days to do the trick. There has been so much in these busy months. Both adventure and togetherness, as well as time apart. There's also been a lot of living with small margins. If you can imagine all the ordinary things that fall behind, you'll have a good idea of what I've been doing ever since. Domesticity has been the ruler of my days. But slowly, oh so slowly. What I missed most is a sense of spaciousness--in my living spaces, and also in my pacing and rhythm. I'm not so adept at down-shifting into lower interior gears. Often the only way to slow down is to find zero and start from there. My therapist reminds me that spaciousness isn't something we DO, it's a way of being. This season for me is about reconnecting with the sufficiency of being, the power of stillness, tending the home inside and out and finding sanctuary there. All the magic and invention and wonder begin here, in the quiet. This month I invite you to join me there. Thanks for being patient with me while I swim in the deep and quiet over here. I'm doing my best to be patient, too. There is a stage in my creative process during which the house could be falling down around me and I wouldn't notice. This is the Quiet Beginning, a stage which is more akin to cocooning than emerging or taking flight. The posture is one of listening--slow, steady, head-bowed listening. It is the time for discernment, for surrender, for dependence on a wisdom both deeper and wider than my own. This stage requires cleanliness and order in my surroundings. Organizing, de-cluttering and scrubbing become compulsions for me, but in their wake I find my thoughts have not only the space they need to emerge, but are lined up in neat and tidy rows. There is a common, widespread idea that cleaning is a sign of procrastination. This idea was damaging to me for a long time. It kept me always in motion without pause and therefore without understanding whether that motion was in the direction I really wanted to go. It may be true, I suppose, that cleaning is about procrastinating for some. But I am not one to avoid my work. I burn to work, so fast and so hot sometimes that the daily tasks of my living--the dishes and tea times and bed time stories--are the only things that slow me down to a pace my body can sustain. Now I know I need this time, and even though the slowness and stillness of the Quiet Beginning is still uncomfortable to me, it's critical to get this part right. To clean and tidy , to slow down, listen and really discern my guidance for the coming days, so I can proceed with clarity, renewed energy and grounding. Mystery novels: It's important not to think too much right now--it counters the resting and slowing that this season needs, and honestly it can really interfere with the listening. If I must feed my mind a little bit, I will read just a single page of a deep-thinking book or article. Otherwise I try to read things that give my analytical mind something to play with to keep it occupied so I can be still. Right now that means catching up on Agatha Christie novels I haven't read since I was a teenager. Tea Time Tray: Caren McLellan Gazley gives a great tutorial on the British ritual of taking time for tea in Ritual & Rhythm: A Guide to Creative Self Care. This is a practice I always aspire to practice and remember, but actually clearing my kitchen counter and creating space for a tea time tray (pictured above) to live out in sight and within reach means it now happens. Every day. 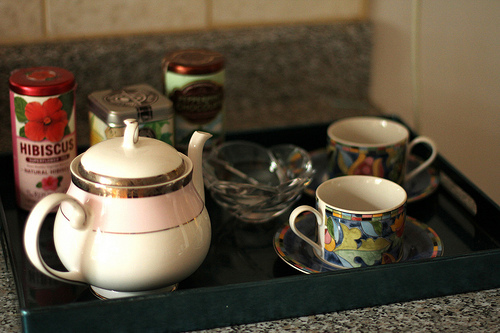 The tray is set and ready for tea at any moment, though the girls and I have been having ours in the late afternoon. Amelia and I are loving this peppermint chocolate rooibos tea, and Lucy is jamming on steamed soy milk with a splash of hazelnut syrup. More photos from the Indie Kindred Tour are coming soon. Next week we return to the Pacific Northwest for screenings in Seattle and Portland, and for the Story Excavation Retreat. Join us if you can! My husband has been walking for about 10 days now. It's been a transition back, as he's gone back to his office and I've converted my own studio back from convalescent room to workspace and refuge. The first day everyone was gone it was SO QUIET. And it's interesting how quiet can become a stranger to us, even as we long for it. We simply forget how to be in its company. I had all this expectation on myself, as if NOW I would be like a racehorse out the gate, fast and unhindered. My phone friends heard this kind of pressure in my voice and urged me to take it easy. To stare out of windows. To not feel that every second now needed to be productive to make up for something--it's only an illusion that anything has been lost. It was a good thing they did, because the next day it was as if two months' worth of fatigue hit me all at once, like that big let-down after college finals when we usually got sick. I had a long list of things to do, but no reserve to work from. So I wrote about this cycle I go through of clearing space, rest, and rapid execution, and I tried to believe, as I struggle to every time, that the productivity and clarity would be there waiting for me on the other side of clearing space and rest. I broke down boxes, and took out recycling. I put things in their place. I watched a lot of Wallander (the Swedish version) on Netflix streaming. I took baths. I walked around the block. But mostly I just waited. It's funny because the old-school approach to getting work done--the entrepreneurial, management-style approach--says that if we start clearing our spaces or wanting to read in bed, we're just avoiding our work. That we should "push through" and keep in motion. I fight against these spells as those old voices nag me, and one day last week I did try to do some work. I was looking over my notes yesterday, which reminded me of the ones I took in college just after lunch, when I would struggle to stay awake through the entire lecture. (Even with the lights on, even when I sat in the front row.) The letters and words are uneven and ragged and difficult to read. The thoughts are so vague in spots that the ideas are even hard to follow. But my notes yesterday looked like they were written by a completely different person. Even and ordered, in columns and categories. I even banged out a couple things on the list like they were no big deal. I'm finding a rhythm again--one that's not dictated and structured by external needs but is directed and guided by something internal. It is being at the source of doing. It is the way I keep proving to myself over and over again that if I'm well cared for, the work takes care of itself. What rhythms are appearing in your creative process? What essential elements are you learning you need to do your best work? Lately I've been talking about Threshold Seasons, mainly because I'm living in one. During Threshold Seasons, we find ourselves operating out at the edges of our capacities, in one way or another. Our limits for things like patience, perseverance, courage, compassion and more are tested and stretched beyond what we previously knew ourselves capable of. Often, Threshold Seasons are marked by shrinking margins, those extra spaces that leave room for the unforseen or the unexpected, both large and small. Think: the morning that's off to a slower start than usual, or the accident we didn't see coming. When the margins grow thin, it's imperative to create new ones. A big part of this is sending a message to our body, which feels the impact of Threshold Seasons acutely. We tell our bodies through every small act of rest or restoration: I Got This, because if we don't, our bodies will shut us down until we do. Send your expectations on vacation. Whether you're up against expectations about time, productivity, or even how good of a mood you should be in--it's time to reevaluate and let go. Threshold Seasons are NOT Ordinary Times, and trying to force them to look the same is only a recipe for frustration. Understand that The Little Things matter more. It's counterintuitive, because one would think that it would be the other way around, but things like having clear surfaces to cook, eat or work on, or clean clothes that feel good--what is a mere annoyance in Ordinary Time is what sends you over the edge in Threshold Seasons. The Little Things need more of your attention right now, not less. Know this: a little novelty goes a long way. When slower, longer and more aren't an option, try something different. One way I'm doing this is with a new breakfast I came up with for the girls: the May The Day Go Gently With Us breakfast. It's comprised of a slice of peanut butter toast, a small (6oz) hot cocoa, and mini-marshmallows, as the day requires. (It's for Emergency Mornings--don't judge.) Changing things up can feel good to your body and soul. Notice the margins you still have. We're always so quick to fill open spaces of time when they pop up unexpectedly or naturally appear during the rhythm of the day. What if you took notice and sunk into those spaces deeply? I'm usually one to wake and roll right of bed, but lately I stay there. Just soaking in a few moments of being held and supported by the earth, and my building and bed, of being covered with soft, warm layers is one way to notice that margin that I still have. Hold your attention. One thing that sends me to my threshold quicker than anything is having my attention fragmented and interrupted. (This made the early childhood years a real challenge for me.) When disruptions outside of my control are high, I pull back on the ones IN my control. This can look like setting aside whole days for each aspect of my work, instead of trying to do a little work on everything every day. It also means curbing the multi-tasting. When I'm editing and waiting for files to import, I do better staying offline and using the space for something more presence-friendly, like sipping tea, looking out the window, or listening to records. I've found that the back-and-forth multi-tasking is never as productive as we think. Focus on the work at hand. The way I'm wired, one part of my mind is always working about three projects out ahead of what I'm actually on right now. And in a Threshold Season, there's just not enough margin for that. Last week Jolie said to me, Could you just make your movie and take care of your husband? As soon as she posed the question, the twenty other things whirling around my head and pouring out my mouth just fell away. Yes, I said, I can. When I focus on the work at hand, it returns me to the sufficiency of this moment, and I can see that while what I have may feel small in comparison to Ordinary Times, it's still enough. I'd love to hear from you: How do YOU survive Threshold Seasons or create new margins? You can leave a comment by scrolling down (or clicking this link if you're reading in your email or RSS Reader). You can also share your tips for surviving Threshold Seasons on the Facebook page.